( The below description of completed objectives is taken from TU Snake River Headwaters Project Manager Leslie Steen’s extensive report forwarded to the Snake River Cutthroats Board of Directors on December 11, 2017. The entire report can be obtained through contacting the TU Snake River Headwaters Project Office). Project Outcomes: Project implementation for Phase 1 of the Tincup Creek Stream Restoration Project occurred between July 15 and September 30, 2017, with Rockin’ T Construction, Swan Valley, ID performing the excavation contract work and CTNF staff providing construction staking and project oversight. Objectives 1 and 2 were accomplished through a variety of treatments including elevating riffles, narrowing the channel, decreasing stream slopes, reconnecting cut off meander bends, reconnecting the floodplain, and resloping and revegetating eroding banks. In total, 1.9 miles of stream were restored: o 1.4 miles of channel were elevated and treated (through narrowing and floodplain reconnection). o 4 historic meanders were reconnected, adding an additional 0.5 miles of channel length. 5 acres of wetland were restored or enhanced through these activities. Objective 3 was accomplished through the above restoration techniques. Pool habitat and pool depth were increased. Large wood added into the system provides structural stability and additional habitat complexity and instream cover, especially for juvenile trout and other native fish species. 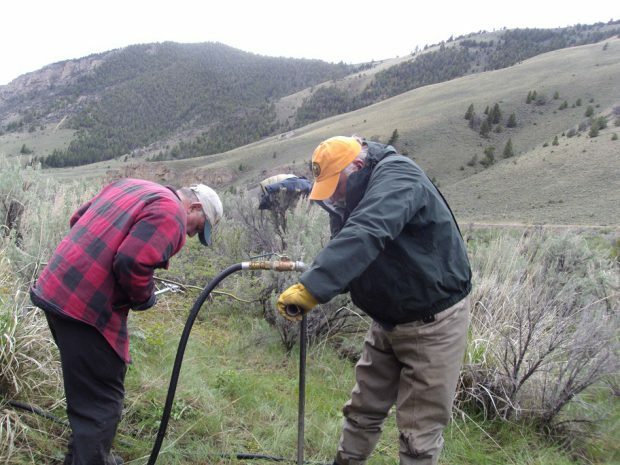 A volunteer day involving three TU chapters (Jackson Hole, Snake River Cutthroats, and Star Valley) was held on October 20, 2017 (approximately 90 volunteer hours). Volunteers helped with the restoration activities, including planting willows and mulching and reseeding restoration areas. The project was featured in the nation-wide online TU Orvis Embrace A Stream matching challenge competition in November 2017, which raised visibility for the project and an additional $1,645 in donations for the project. Cross fences in cattle allotments were improved. A new cattle guard was installed to protect an additional 0.8 miles of leatherside chub habitat as well as provide better late season management of cattle, giving the project more effective rest from grazing use. A monitoring plan was developed by CTNF and IDFG staff, with pre-project habitat and fish monitoring completed within the Phase 1 reach as well as in representative sampling units outside of the project area. A press release was distributed to regional newspapers and posted online at TU.org. The project was featured in an Idaho Soil & Water Conservation Commission October newsletter and in partner newsletters, emails, and social media sites.